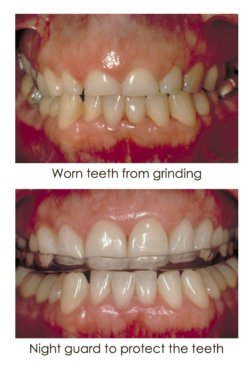 There are certain risk factors that are associated with night time tooth grinding. Night time tooth grinding that is left untreated may cause permanent damage to your jaw joint and teeth. Besides breaking and wearing down teeth, grinding irritates the nerves in your teeth and can cause hot, cold and chewing pain in your teeth. Tooth grinding may also lead to chronic headaches and chewing muscle sensitivity during the day. If you’re concerned about nighttime teeth grinding, feel free to bring it up during your dental consultation. You can set up your first appointment with the Djawdan Center by contacting us or calling us at (410)618-5966.